A new European consortium, MINIGAS, led by VTT Technical Research Centre of Finland, is developing a miniature gas sensor to detect greenhouse gases. The European Union has funded a 2.8m Euro project called MINIGAS to develop a tiny, super-sensitive and cost effective gas sensor. 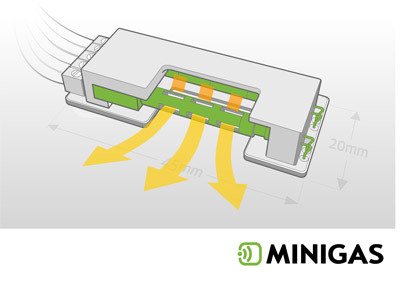 The MINIGAS sensor predicted to be 5 cubic cm (cm3) in size and at least twice as sensitive as other sensors of its size. In addition to combating greenhouse gases, it will be able to detect explosives vapours and chemical agents (nerve gases, etc) when integrated in homeland security sensor systems and moreover it could have broader consumer benefits such as improved air conditioning in buildings. The MINIGAS consortium brings together world-leading institutes and multinational companies from across Europe. VTT leads the programme, with the core photo-acoustic gas sensing technology also coming from Finland via Gasera, a spin-off company from the University of Turku. The Ioffe institute in Russia provides Light Emitting Diode (LED) technology and QinetiQ brings its miniaturisation expertise in addition to leading on exploitation. Two other multinational companies complete the team – Doble to market the sensor for greenhouse gas applications and Selex to sell MINIGAS to homeland security markets. High-sensitivity gas sensors measure the presence of trace gases. They have a wide range of applications. Gasera has recently developed a MEMS-based mechanism for detecting the pressure waves created in a photoacoustic (PA) cell. This innovation can be used to realize infrared gas sensors of extreme sensitivity. Instead of the usual microphone (membrane with capacitive readout), the Gasera cell contains a “free-standing” silicon cantilever. The mechanical movement of the free end of the cantilever is 100x larger than the centre of a fi xed membrane. Furthermore, the movement of the cantilever is detected interferometrically not capacitively. The resulting improvement in sensitivity by these innovations is about three orders of magnitude over the prior art. Three international patent applications are pending. Whereas other optical gas detection methods can not be miniaturized because of the long optical pathlengths needed for high sensitivity, theoretical analyses predict that the cantilever PA cell can be miniaturized. out by the use of Si MEMS and Low Temperature Cofired Ceramic (LTCC) technologies. For further info, please visit the MINIGAS public web-page.